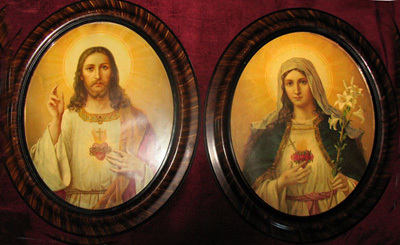 Jesus and Mary are the two first foundations of the Cathoic Religion, the two living springs of all our blessings, the two centers of all our devotion, and the two objectives you should keep in view in all your acts and works. A man is no true Catholic if he has no devotion to the Mother of Jesus Christ and of all Catholics. St. Anselm and St. Bonaventure assure us that it is impossible for persons who are not loved by the Mother of Christ to have any part with Him. Conversely, it is impossible for anyone to perish upon whom she looks with favor. As you must maintain the virtues of Jesus and keep with you His sentiments, so you must also maintain and keep with you in your hearts the love, tenderness and devotion that Jesus Christ cherished for His Blessed Mother. He loved her most perfectly and accorded her the very highest honor in choosing her to be His Mother, giving himself to her as her Most Beloved Son, taking from her a new being and life, becoming subject to her, following her guidance in outward things during His childhood and hidden life, and, afterwards, crowning her Queen of heaven and earth, glorifying her and causing her to be glorified by the whole world. 1. You must see and adore her Son in her, and see and adore Him alone. It is thus that she wishes to be honored, because of herself and by herself she is nothing, but her Son Jesus is everything in her, her being, her life, her sanctity, her glory, her power and her greatness. You should thank Our Lord for the glory He has given to himself through His admirable Mother. You must offer yourself to Him and ask Him to give you to her, causing all your life and all your acts to be consecrated to the honor of her life and her actions. You must pray that He will make you participate in her admirable love for Him and in her other virtues. You must ask Him to employ your life in her honor, or rather to honor himself in her, in whatever way He pleases. 2. You must recognize and honor her first as the Mother of God, then as your own Mother and Queen. You must thank her for all the love, glory and perfect service she rendered to her Son Jesus Christ Our Lord. You must refer to her, after God, your being and your life, subjecting yourself entirely to her as her slave, imploring her to direct you in all your affairs and to assume full power over you, as over something belonging entirely to her, and to dispose of you as she pleases, for the greater glory of her Divine Son. You must beg her to employ all your actions to honor the infinite works of her Son, and to associate you with all the love and praises that she ever gave Him and ever shall give Him throughout eternity. 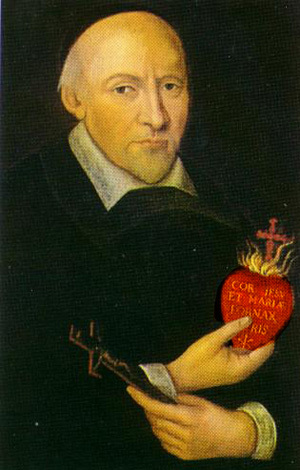 By imitation, striving to imitate our admirable Mother, especially her charity, her pure love, her detachment from all things and her most divine purity, the thought of which ought to arouse in you a powerful desire to shun and fear more than death the least fault against purity, whether in thought, word or act. Finally, you may honor the Blessed Virgin by special prayers or works of devotion, such as the Rosary, which ought to be in common use among all Catholics, and the Office of Our Lady, which you should recite in union with the love and devotion of her Son Jesus for her, in honor of both their perfect lives and of their sublime virtues.